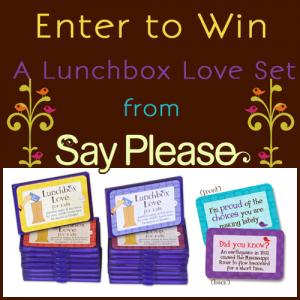 GIVEAWAY: Enter to win a Lunchbox Set for you and one to give to a friend (Ends 8/16/13 at 11:59 PM EST) | A Savings WOW! Grand Prize: A Lunchbox Set for you and one to give to a friend! You’ll win the Lunchbox Love for Kids Volumes 33-48 – Lunchbox Love® – positive notes and fun trivia and jokes for your child’s lunchbox, backpack, binder, or pillow. Busy parents and caregivers will love this easy yet meaningful way to stay connected with their children throughout the school day. Positive words on the front inspire while fun trivia and jokes on the back entertain. Each volume contains 12 cards–10 with different phrases and fun facts or jokes and 2 blanks so you can add a personal message. Positive words can change someone’s day, a life, and eventually the world. The giveaway will open up on 8/13 12:01 am EST and close on 8/16 at 11:59 pm EST.